tag: BeYouBling: My "Why" Story! Could I possibly love a job anymore than this? I think not! I've done other direct sales before finding Paparazzi and this is the one that sings to me. I wake up earlier than I ever have just to get started on my day and if you know me you know I don't like to get up early. I started my Paparazzi business in October of 2012 and it just keeps getting better and better. Delivery days are so thrilling! It's literally like Christmas and if I'm working my business then Christmas comes every 1-2 weeks. Eek! I live in Washington state, where some of the world's finest musician live. I have two kiddos and I've been married to my best friend for 1/3 of my life. We have 2 rescued greyhounds, a 10 year old chinchilla and some very frustrated angelfish. The people that I have met through parties, events and networking are simply amazing. I don't have words for the gals that have joined my team, they are so amazing. Each of them run their business a little bit differently and I learn from them everyday. I'm a people person apparently, that's what everyone tells me. They say they could never do what I do because they are shy. I tell them I'm just as intimidated, but it's not going to stop me. I'm all about personal growth, if anything I do this business because it makes me a better person. 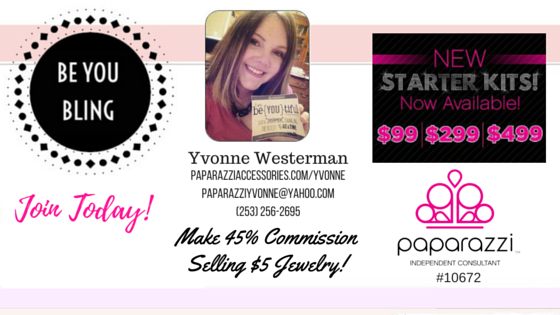 I can make someone's day with $5 jewelry and that's pretty awesome. There's nothing in the world like making someone feel beautiful with a simple compliment. Okay so why Paparazzi? It's cute! It's $5! It's fun!! It sells itself!!! All I have to do is show up with my jewelry and people want it and most buy it. People don't have to think too hard on it because it's only $5. There are no catalogs, order forms or shipping because it's all cash & carry. GENIUS!! 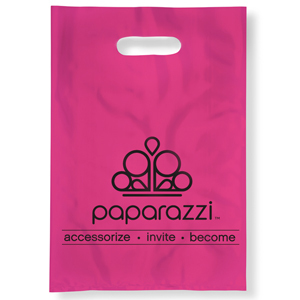 Everyone wants to take home a pink Paparazzi bag with at least 1 piece of jewelry in it. Often times much more! This is the kind of company that makes you constantly say "why didn't I think of that". So that's my why and I'm loving every bit of it. You can work as little or as much as you want. It's pretty exciting how $5 jewelry can change your life!